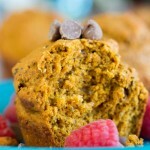 These light, fluffy, crumbly and chocolatey Pumpkin Banana Muffins will be a perfect holiday breakfast. It has been WAY too long since I’ve posted, and I’ve missed it! 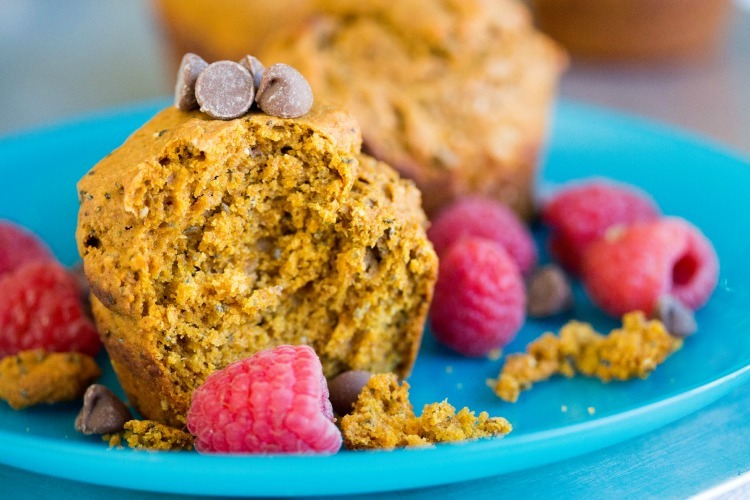 These Chocolate Pumpkin Banana Muffins were just the motivation to take a pause during life’s craziness and share this recipe. Am I the only one who self inflicts pure craziness upon myself? The other day I was running in 10 different directions and stopped for a minute to think why things were so disarray. Then it hit me… I’M the reason for the chaos. From being a mom, wife, involved in my church, registered nurse, blogger, and organizing the most killer food blogger conference in existence, I chose every crazy thing going on around me AND I love it! I love the holidays where everything slows down for just a second and reminds me how my husband and kids are by far my most rewarding and energizing part of my life. My baby boy is 15 months and his cheeks just scream ‘kiss me all day, mama’! My sweet girl is almost 4 and love her sassy, independent mother-to-anyone-smaller-than-her self. AND I just celebrated yesterday 8 years with my husband, best friend, and equal partner in every way. I’m one blessed lady! No complaints here… except that I already ate all of these muffins. I know I’ve already confessed how I’m not a huge chocolate fan (inserts gasps). However, even I can’t resist a little chocolate now and again AND I can still make it healthy. I’m seriously addicted to muffins. Like I make them almost every morning. 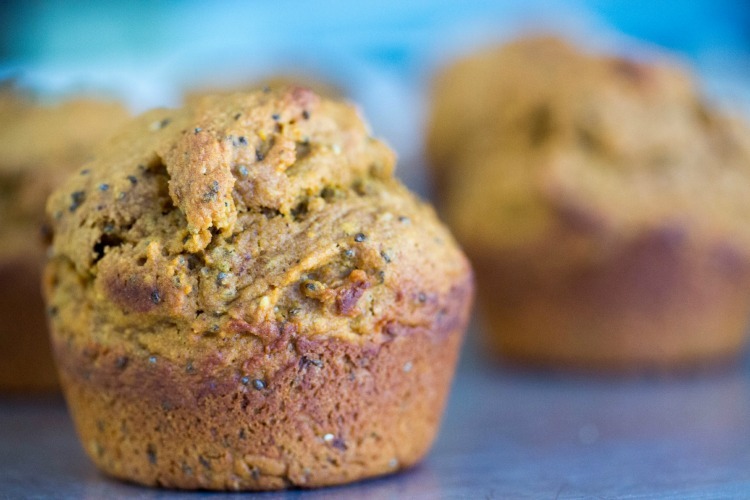 My Banana Muffins and Pumpkin Muffins continue to be some of my most popular… so why not combine and throw in some chocolate? I’m giddy when thinking of Thanksgiving. Thanksgiving is my ultimate holiday since it’s all about food and family. For this foodie, my mouth starts watering non-stop around this time of year anticipating the upcoming feast. Here’s a couple suggestions for side dishes: Sauteed Asparagus, Honey Cornbread Muffins, and Healthy Sweet Potato Casserole. Well, I need to get back to life. It was great spending a moment with you! I hope you enjoy this time of year as much as I do. 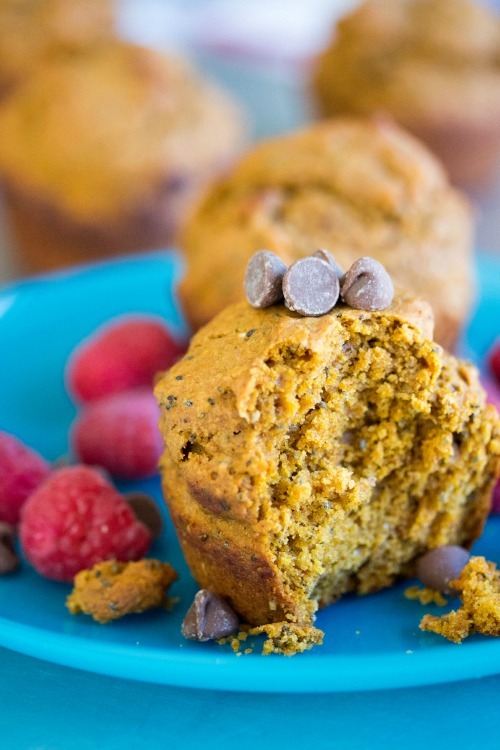 Enjoy this Pumpkin Chocolate Banana Muffins recipe! In a large bowl, whisk together the banana, pumpkin puree, applesauce, honey/maple syrup, olive oil, milk, and vanilla. In a separate bowl, combine all remaining dry ingredients together. 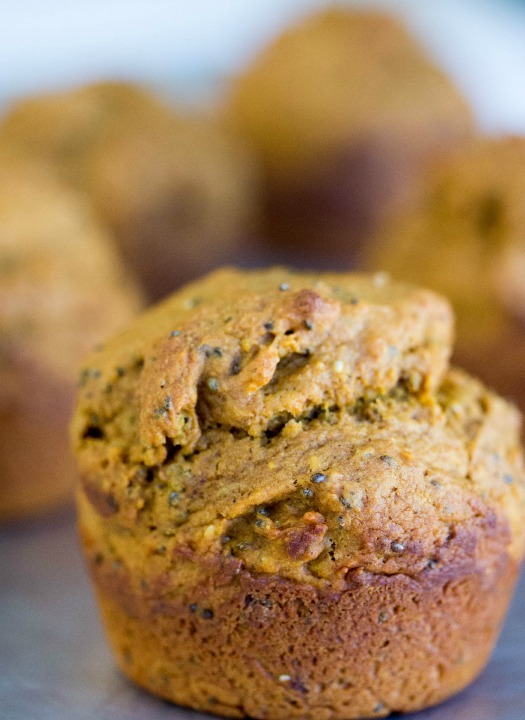 Fill lightly greased muffin pan with about 1/4 to 1/3 cup of batter. Bake for 20-22 minutes or until the tops have browned. The inside will be moist!